This fun Green Grape Slushies recipe was developed by Kim Beaulieu from Cravings of a Lunatic especially for us here at Produce Made Simple. I’m thrilled to be here today sharing a fun simple recipe for Green Grape Slushies. Grape season is in full swing and just happens to coincide with Spring Break (aka March break) for most schools here in Canada. 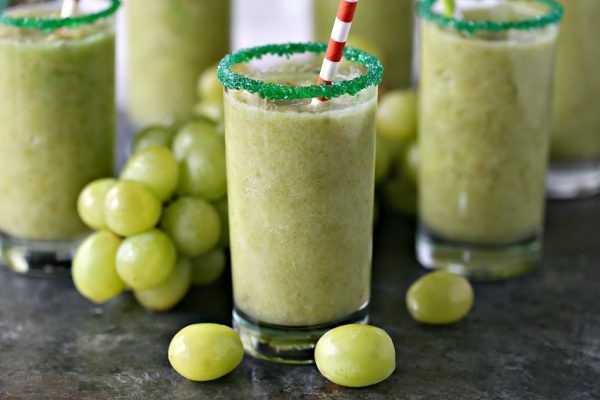 These Green Grape Slushies are perfect for kids of all ages. You could make them for birthday parties or sleepovers. They would make a great refreshing drink for after sporting events too! You can also serve a boozy version of these Green Grape Slushies for adults if you like. Perfect for St. Patrick’s Day or even a girls night. Make sure you pick plump, even-coloured grapes that are still attached to the stem. 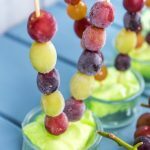 Green stem equals fresher grapes. That’s a win in my book. When storing grapes be sure to keep them away from produce like onion or garlic. You want to avoid grapes absorbing the aroma of pungent foods they are stored close to. We absolutely LOVE all grapes but Thompson Seedless from Chile are my favorite. Thompson grapes are clear green and have a crisp texture with sweet flavour. What I dig most about them is that they freeze beautifully. Wash them just before using and be sure to dry them really well. Then you can place them on a parchment lined cookie sheet and pop them in the freezer. Once they are frozen you can place them in freezer bags to use later, or to make my Green Grape Slushies!!! Remove the grapes from their stems. 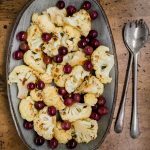 Wash them thoroughly, dry completely then place grapes in a single layer on a parchment lined cookie sheet. Place cookie sheet in the freezer. Once grapes are frozen you can remove from freezer and place them in a blender. Pour lemon-lime soda in blender. Pulse the blender until slushies are smooth. Add more lemon-lime soda if you prefer your slushies a little less thick. If you are making these for adults, add the alcohol to the slushie just before serving. If served with alcohol, please remember to enjoy responsibility. Pour into prepared glasses. Serve immediately! Get started and add sugar rims on your serving glasses. 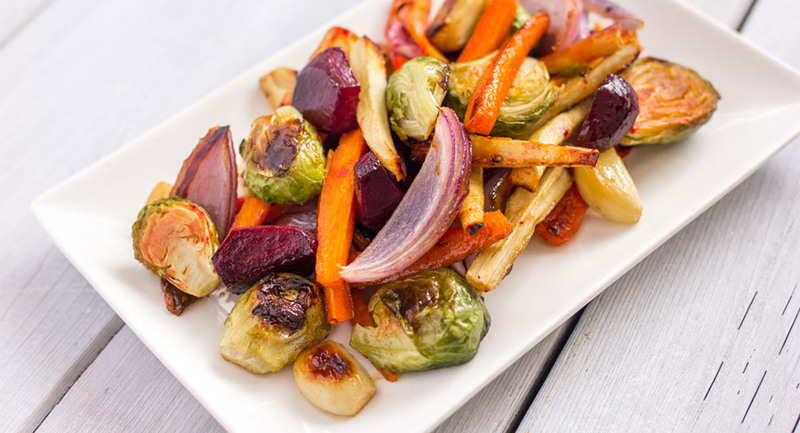 • Pour about 1 to 2 tablespoons of water or honey in a small dish. Use small brush or your finger to coat the rim with liquid. • Pour about 2 to 3 tablespoons of coloured sugar onto a small plate or bowl. Dunk the rim of each glass into the sugar and then set the glasses aside. 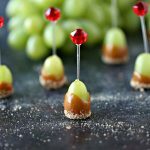 This recipe was developed in partnership with Fruits from Chile.